ASHLAND, Ore. – Toss away that thought of building an expensive wine cellar to age and protect your precious vintages. Eric Weisinger buries bottles in the ground. One at a time. And thousands of miles apart. Weisinger is a wandering winemaker. He spends half of the year in the Rogue Valley and the other half in New Zealand, making wine and serving as a consultant to grape growers. In between, he creates his own wine and stashes cases of it in his Ashland home, the crawl space under a friend’s house and, for a few dozen special vintages, in the woods, on an island, in different countries, on different continents. Years later, he tries to find them using GPS coordinates and his memory. Weisinger’s unconventional way to cellar wine came to him when his head was in the clouds. He was hiking with friends around the Grizzly Peak summit in 1992; his backpack was filled with food and a bottle of his wine. A thunderstorm interrupted the hike before lunch, and instead of taking the bottle down the mountain he buried it on a rock cliff that shadows the valley. “It’s a beautiful site and requires a good part of the day to reach it if snow on the road doesn’t stop me,” he said. The bottle, he thinks, is still there. To find it again, he would have to rely on his memory since he didn’t draw a map of where he left it. “I’ve looked for it on occasion while hiking around the peak since, but never with any luck,” he said. Since then, the 20 or so other bottles he has left underground have been marked with stones and the spot captured either with a photo or, lately, coordinates on a GPS device. 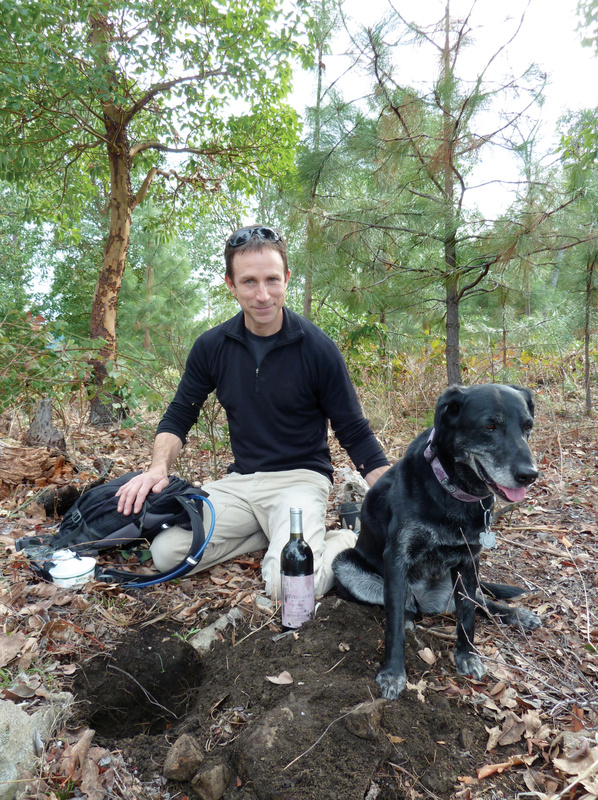 He has planted his very best cabernet franc, merlot, cabernet sauvignon and malbec in some of the highest peaks in Oregon and Colorado and as far away as Mongolia. In 2008, he unearthed a bottle of 1997 Petite Pompadour, a Bordeaux-style blend, that he buried in Belize eight years before. Weisinger selects the spots carefully. They all take effort to reach, have stellar views and are places he would like to return to someday. He marks the bottle with a message – “When found, please enjoy! Eric Weisinger” – wraps it in protective clear plastic, sets it in the hole and covers it up with leaves and natural debris.